Every Indian adores the sport of flying kites. Memories of childhood summers and festivals such as Sankranti are all intertwined with kites. Whether one is trying to manipulate the wind, feel the sun’s rays warm the skin, indulge in some healthy competition or simply just feast the eyes with beautiful colors and shapes soaring in the air, Kite-flying is pure, traditional, innocent fun. A kite, though delicate, is truly wonderful when free and uninhibited, rising up in the sky. Hyderabad is also like a kite. Wild, Magnificent and Fragile! Here is a glimpse of Hyderabad’s gorgeous Movie tower road, Kokapet. Little lakes, clusters of rocks/boulders and amazing views surround the long winding road on both sides. 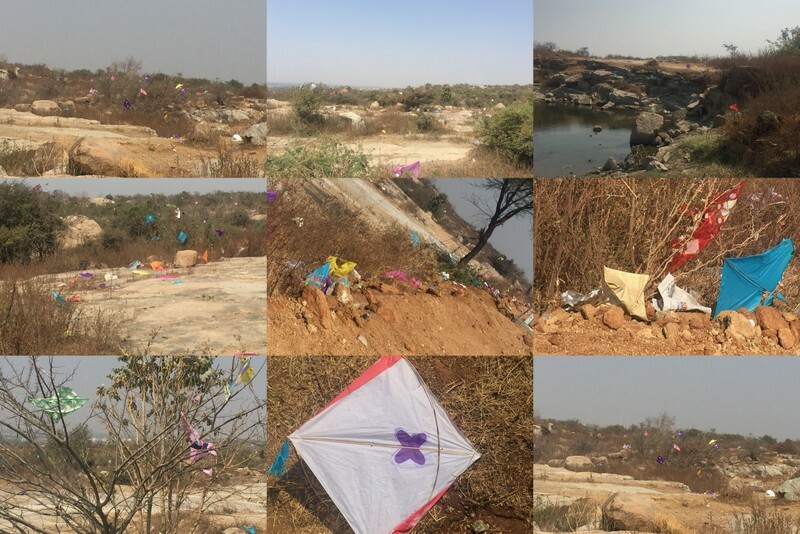 And then, during a weekend in January, 2018, someone concocted a plan to fly kites in this space. Why not? A lovely ecosystem with clean air, still water, solid rocks and enough empty space! 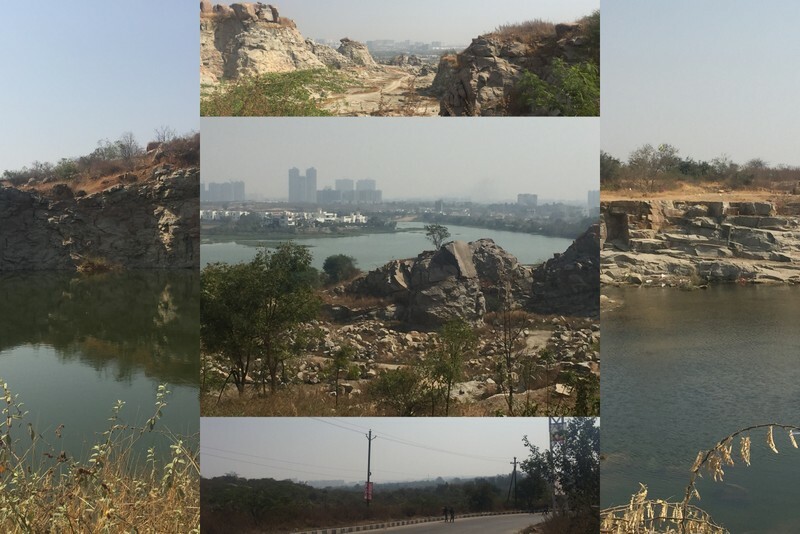 As citizens of Hyderabad, we have every right to enjoy the beauty of nature that surrounds us. But, we absolutely have no right to trash it. Yet, that is exactly what happened. Mother Nature was trashed! Here is the evidence! This cannot be acceptable! We Indians are better than this! Whether this was an act of ignorance, negligence or carelessness, it has to STOP! Such behavior is not sophisticated or environment friendly. Citizens: Going forward, let’s make a lifestyle change. 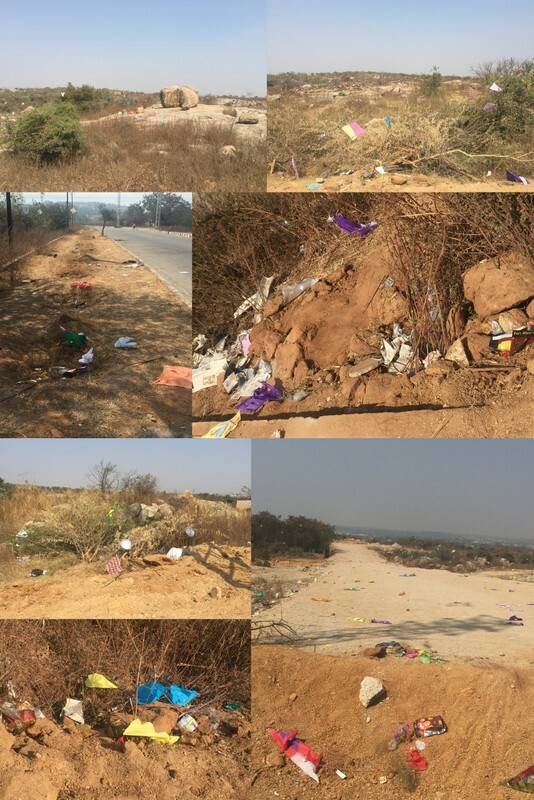 Let us not leave our trash behind, no matter where we go (unless there is a clearly marked trash-bin)! Our PURSE and our TRASH are both ours, nobody else’s. So, let’s not leave it behind. Let us respect our Environment, our City, our Mother! Let’s not trash her!